The final frontier of Biological Sciences could be considered understanding the effects of variation in the DNA (and RNA). If after fertilization the DNA of the zygote could be genetically engineered to prevent complications occurring later in the life of that human being, it could become the ultimate medicine. Also, we know that (in humans) only 2% of the genome encodes genes that are translated into proteins; is the rest required for function? Can DNA & RNA be considered the ultimate blueprint of all living organisms? This question can't be answered with a simple yes/no, but I would say that the analogy of DNA being the "code" used by cells is a reasonable one, if taken with a number of other considerations. When Watson and Crick first described the structure of DNA (being a double-stranded sequence of the nucleotides Adenine, Cytosine, Guanine and Thymine) this led to what is known as the Central Dogma of Molecular Biology , which posits that DNA makes RNA makes Protein (figure from , as originally produced by Watson). As you correctly point out, less than 2% of the genome is protein-coding, however our understanding of the rest of the genome is increasing manifold due to projects like ENCODE , which are discovering not only the "regulatory" regions that control the expression of protein-coding genes, but also the discovery of non-coding RNA's, many of which are totally uncharacterised . The point of this section is to clarify that although only 2% of the genome codes for protein, it is incorrect to say the rest is "junk" or non-functional. The Central Dogma described above is now an outdated model - certainly some DNA makes RNA makes Protein, but not all; many RNA molecules are functional in their own right. You could argue that proteins and non-coding RNA molecules are the product of "scripts" in the DNA that are run or performed by cells, although you are unlikely to find any genomic scientists talking in these terms. Where the analogy breaks down is that all* the cells in an organism have the same genome, yet they are vastly different to one another. 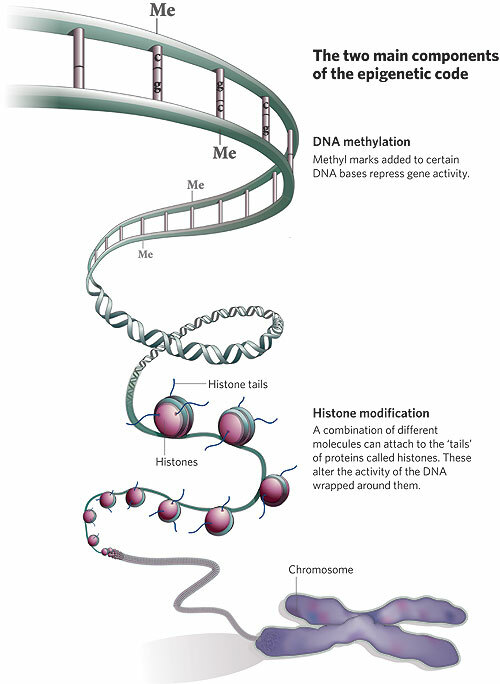 These differences are due to epigenetic processes, which are described as non-coding modifications to the DNA that affect expression of transcripts. A basic overview can be found here . DNA is actually a 3-dimensional structure, and is wrapped around proteins called histones, which wrap together to form chromatin and the characteristic chromosomal structure. In short, genetics and the DNA sequence can certainly be thought of as the blueprint for an organism - changes to this sequence can profoundly affect phenotype - however it is too simplistic to imagine that the sequence alone provides all the information needed. Not only are there many non-coding molecules essential for functioning in cells, there is exquisite control over expression by DNA modifications that do not affect the sequence of nucleotides and are essential for cellular differentiation. The ENCODE (Encyclopedia of DNA elements) project  is making headway into the interpretation of the non-protein-coding elements of the DNA, but there is still a long way to go. Not the answer you're looking for? Browse other questions tagged genetics dna molecular-genetics rna or ask your own question.